James Cortex Hoover was born on July 4th in 1896 in Harris Community east of Fayetteville, Arkansas. His father was Albert Hoover. He died on December 11, 1954 at the age of 58. He is buried at Oak Cemetery, Fayetteville, Arkansas. Hoover was raised by his grandmother. His grandfather was a Methodist minister who helped build St. James Methodist Church in Fayetteville, now on the historic registry. The church was built from discarded bricks from the University of Arkansas’ original building, known as Old Main in 1873-1875. James Hoover was a leader in the church for many years. Hoover married Rissie (last name and date unknown). They had 4 children, (in order) Albert, Minerva, Frances, and Theressa. After his wife’s death when the youngest child, Theressa, was about 4 years old the maternal grandmother moved to Fayetteville from Cane Hill and helped care for the children. Later James married Edith M. Stevens (date unknown), a woman from Bentonville, Arkansas. With his second wife he had one child, Russell. Hoover ﬁnished only the sixth grade but had drive, determination and a strong sense of responsibility, attributes he taught to his ﬁve children. Four of his ﬁve children graduated from college. 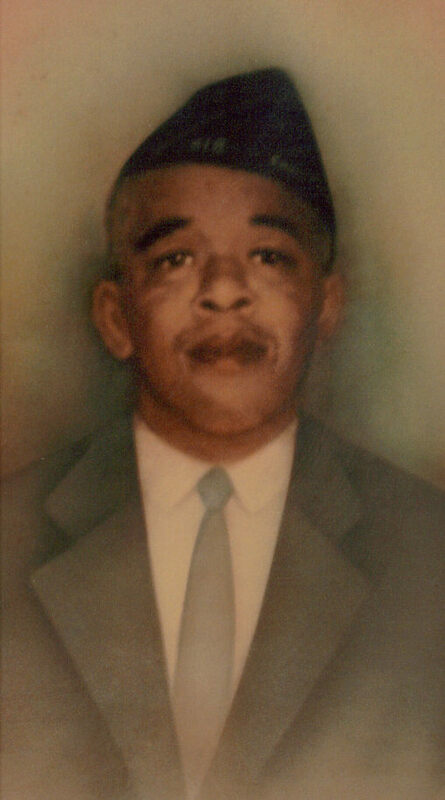 At that time, the University of Arkansas was not racially integrated so he sent one of his girls, Theressa, and one boy, Russell (son of Edith) to Philader Smith College in Little Rock, Arkansas; one daughter, Minerva, to University of Arkansas at Pine Bluff (at that time, the Land Grant College for African Americans); a son, Albert to Southern University in Louisiana on an athletic scholarship, one daughter, Frances, to nursing school and then later to Washburn University in Topeka, Kansas near where she worked at the Veterans Administration Hospital. Russell is the only one who did not complete his college degree. James Hoover served in the US Army during WW1. When he was discharged he moved to Fayetteville, Arkansas. At that time, Fayetteville City Hospital was seeking a dependable porter. He was hired in 1919 and worked there until his death 35 years later. James Hoover was so respected at Fayetteville City Hospital that a wing of the building was named in his honor. This respect came from his ability to do almost anything asked of him, cheerfully and well. Dr. Harrison said, James Hoover knows the human bone structure as well as any doctor. It is never necessary for me to take an x-ray of a broken bone. He can tell where the bone is broken by feeling it and set it correctly.”. James was ambidextrous and could do thing equally well with either hand. Before the hospital had an elevator, James carried people up the stairs to the hospital wards. He was ever smiling, ever ready when a job was to be started or finished. “He knew how to be gentle even with his superior strength. He was equally good with children and old folks”, said Miss Riley. Theressa Hoover, his daughter, said that her father was very disciplined. He got up early and heated the cooking stove, got the children up, then walked over the hill about six or seven blocks to the hospital. Theressa remembers on several occasions taking him something from home. When she couldn’t ﬁnd him anywhere else she could ﬁnd him in the laundry room helping to get the laundry out. Theressa said that her father was a giant to her. He was strong and patient, but expected the children to do as told. He was highly respected in the community. When he walked home from work, everyone along the way greeted him. Sometimes neighbor children would hang on to his arms as he walked. Hoover worked long hours but if the hospital was not busy on Sunday, he would go to the Methodist Church with his children. Later he got a half day off on Sundays, a special time for the family. Even though he could not be at home for dinner, a plate was always set for him at the head of the table, for he might have time to come home to eat.